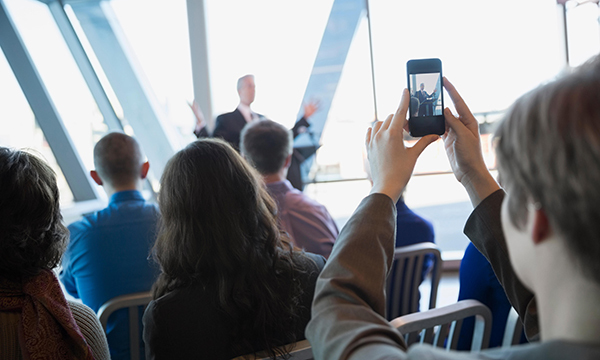 Legal advice: is it okay to record presentations at conferences or workshops? To avoid copyright infringement, always get permission before recording a presentation, says legal expert Marc Cornock. It is becoming increasingly common to record presentations on mobile devices. I was giving a presentation in Germany recently and almost half the audience seemed to be taking photos or recording it. Copyright, or legal ownership, of a presentation rests with the person who wrote it, unless they have given it away to someone else. This means it is they who decide what is to be done with it, and this includes recording. If you are simply taking photos of the slides for personal use instead of making notes, this would normally be permissible, provided you do not reproduce them elsewhere and fully acknowledge them in any work. But you should still ask before taking pictures. However, if you are recording the presentation either as audio or video, you are infringing the copyright of the presenter. It is possible that a recording is being made for sale to those who were unable to attend the presentation, or to those who were present and want a permanent record of it. Your recording would then be in competition with the official record, and if you are videoing the event you are potentially infringing the rights of the other people you capture in your video. As well as being an infringement of copyright, this can be off-putting for the presenter. So if you want to record a presentation, you need to get permission from the presenters and the organisers before you do it.